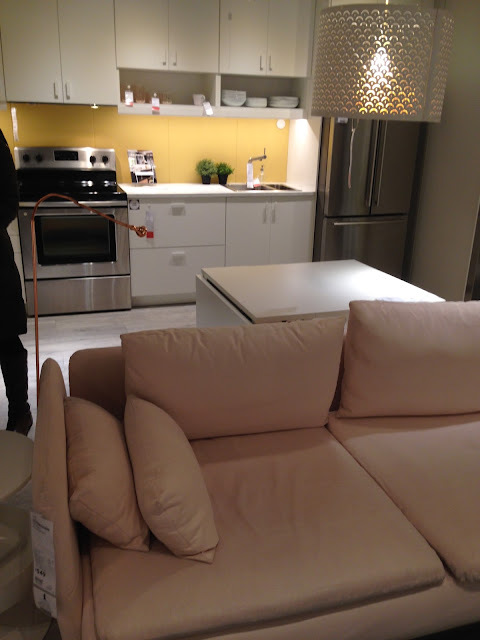 Whenever I visit my children in Illinois, I love to go to IKEA! I don't buy much, I usually just purchase food items (have you ever tried their oatmeal cookies? AMAZING!) 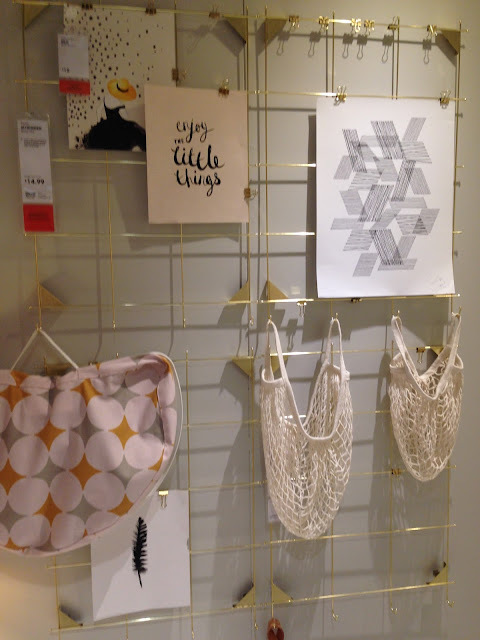 and small decor items. 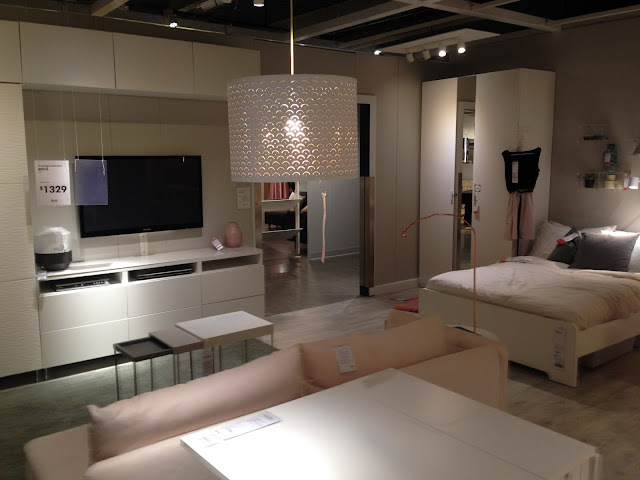 My main reason for going is because I love to walk through their showrooms and get ideas! I think their small space living ideas are incredible. This small living space that my daughter and granddaughter are exploring, was so pretty! I said "I could so easily live here!" Of course, I'd probably have to get rid of all my crafty stuff and 3/4 of my clothes, but I could still live here! 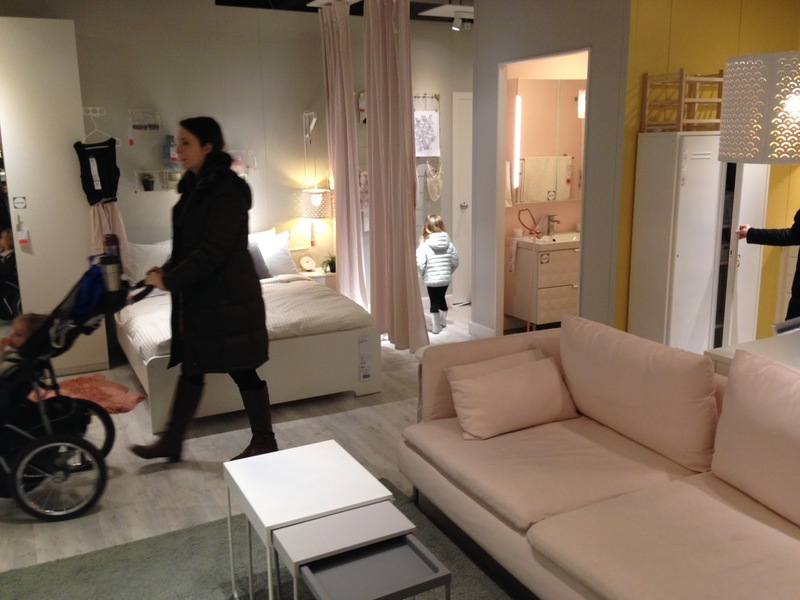 I loved all the pink, especially the pink dividing curtain and the pink sofa. 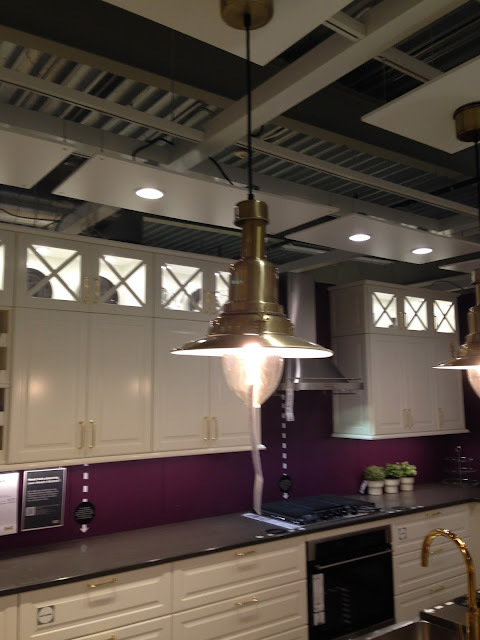 Here is the kitchen portion of this room. And here is the entertainment area of the room. 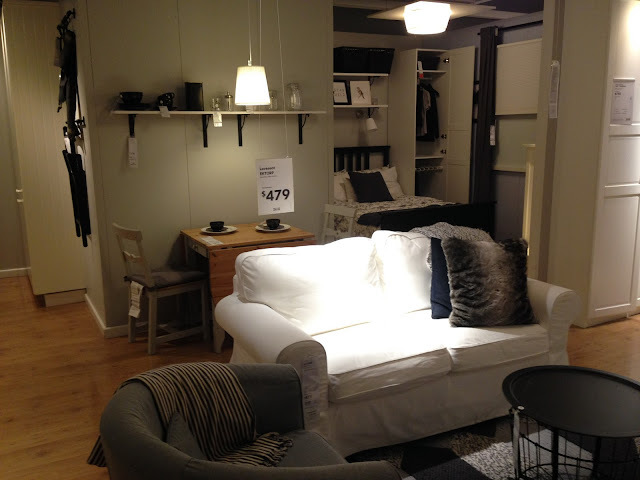 I had just finished painting my new living room when I was visiting my kids, so I was on the lookout for new furniture. That's another reason I wanted to go to IKEA; to check out their "all white slip covered furniture" that's all the rage. Unfortunately, although I found a lot of furniture that I liked the look of, (like the grey couch below), I didn't think it was comfortable when I sat on it. 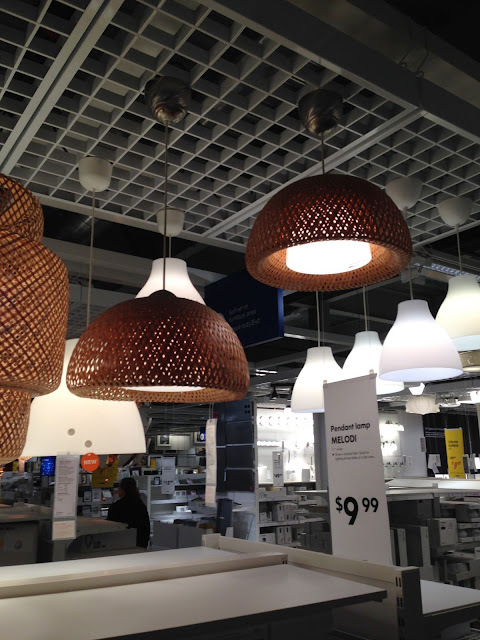 I was also on the hunt for interesting pendant lighting for another room in our home we will be remodeling next year. 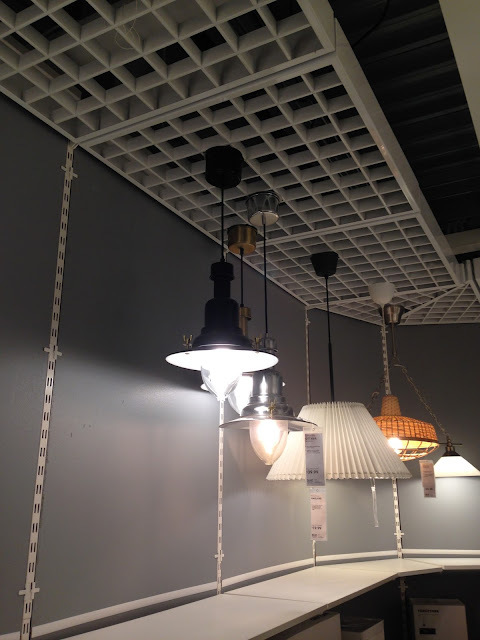 I saw a lot of lighting I liked, but nothing screamed "Take me home with you!" 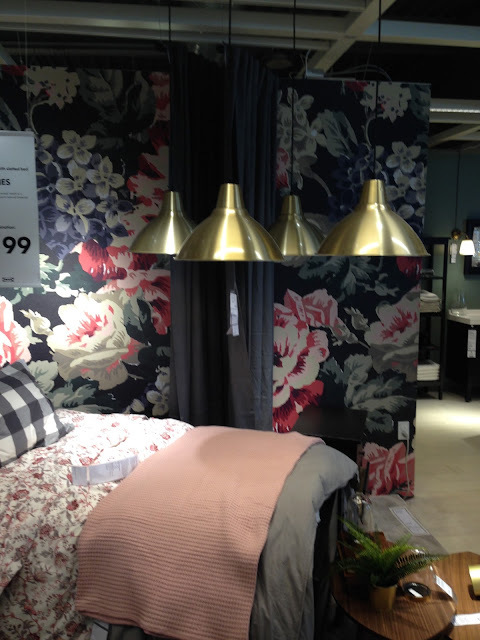 On a side note, notice the floral wallpaper? 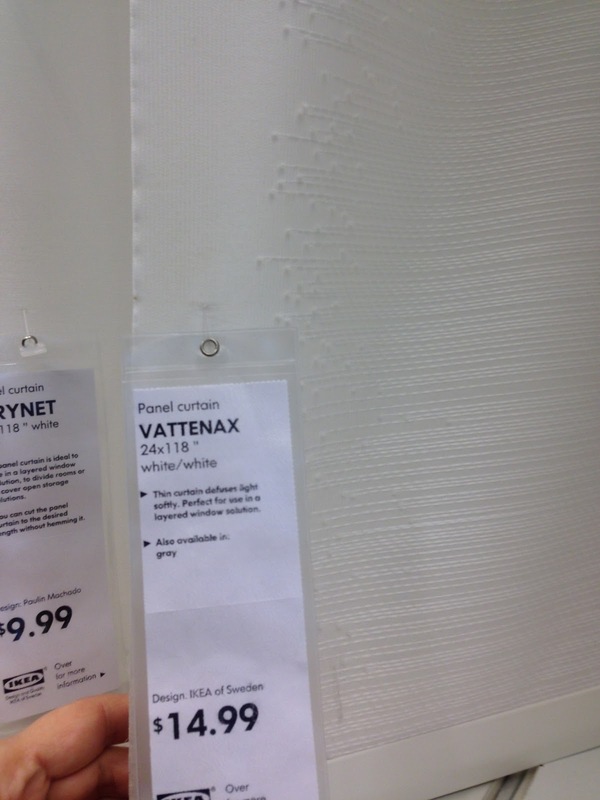 Wallpaper is back in style, especially if you only wallpaper one wall. 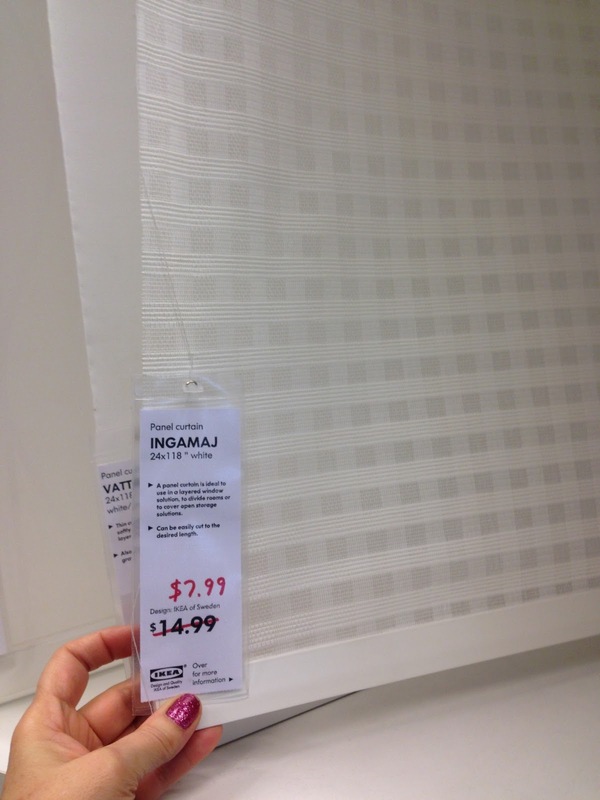 I would never do wallpaper, because when I bought my house 25 years ago every wall (and ceiling) was covered in wallpaper. I spent years stripping it off, so I would never put it back in. But I will appreciate all the pretty wallpaper designs I see. 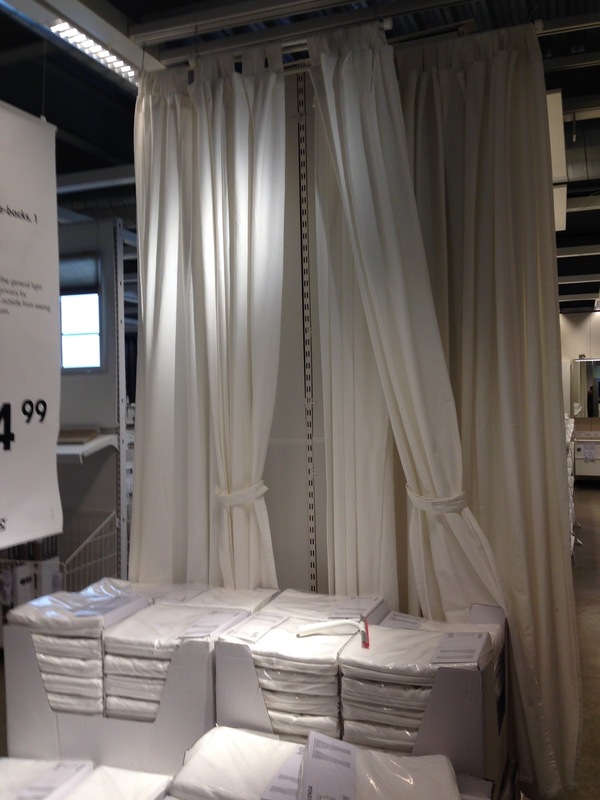 I spotted these curtains and made a mental note to consider them when we begin our next room remodel. 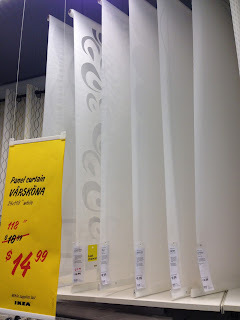 My husband and I discussed having a curtain to separate a living space from a sleeping space in that room. These will work great! Here is the famous "All White Slip Covered Couch" every Instagram woman wants in their home. I sat in it, and just wasn't comfortable. I also thought it was a little pricey for "cheap" furniture ($479.00). And, I don't know, they just look kinda sloppy to me. I get the attraction, but in the end, I passed as I didn't think they would work for me. I really liked this wire storage rack idea, it would be perfect for long necklaces and scarves. 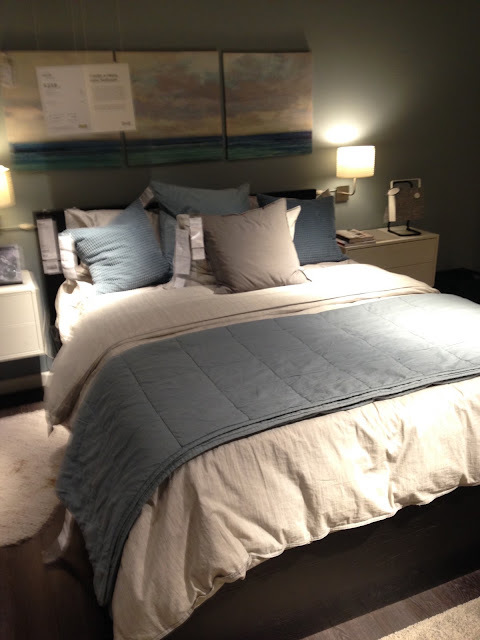 I took a picture of this showroom because the duvet cover is the same cover I purchased for my guest room. When I decorated my guest room, I used pink as the accent color, so it was interesting to me to see my same duvet cover accented with blue. If I ever decide to get rid of the pink, blue would work too! 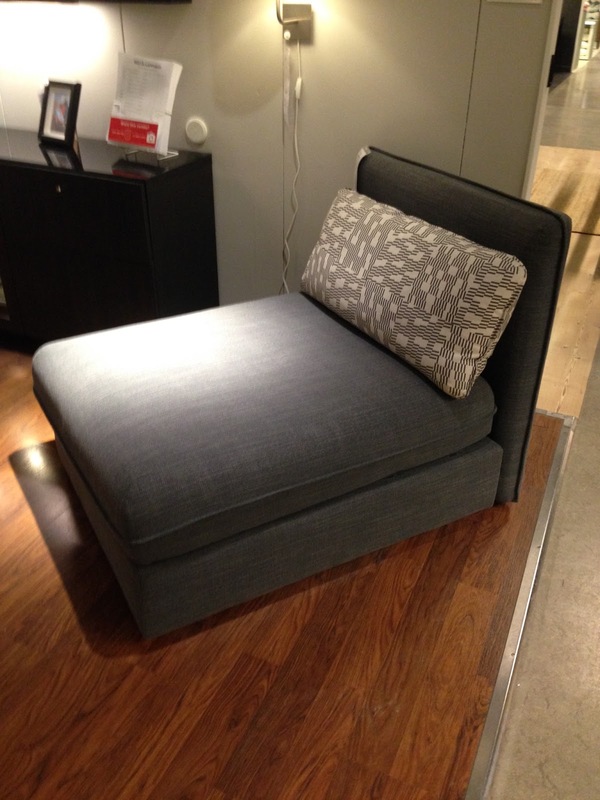 One of the items I was considering buying for my new living room was a chaise lounge. 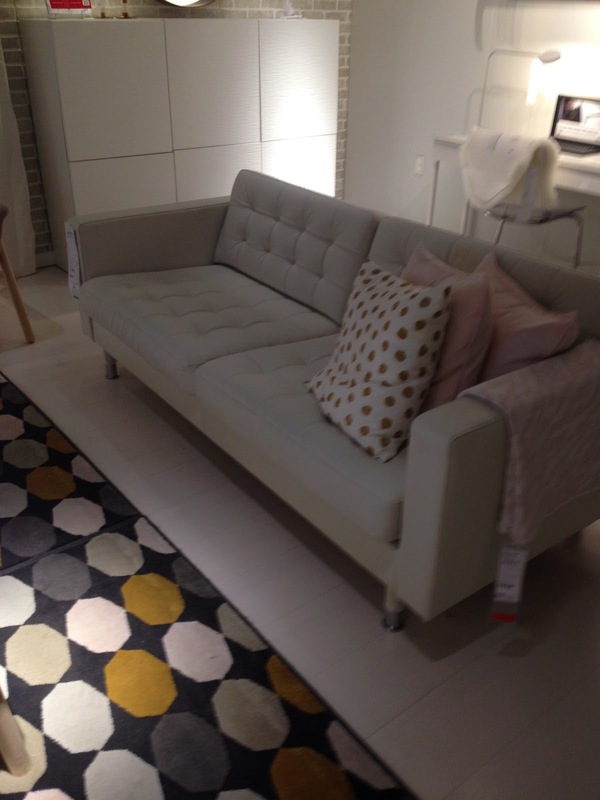 I liked the modern look of this one, but again, when I sat in it, it was terribly uncomfortable to me. I LOVE, LOVE, LOVE how they decorated these pink vases. I actually purchased two of these leaves the last time I was at Ikea, but I just left mine tall. 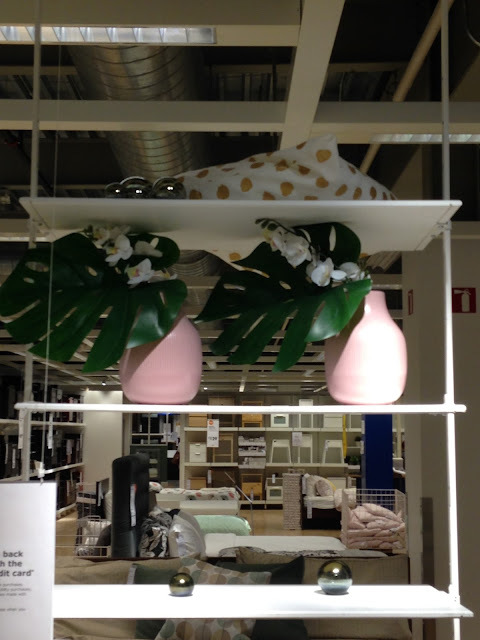 This is a brilliant idea to bend the stem and add an orchid. I really must try this! These planters are so cute too! 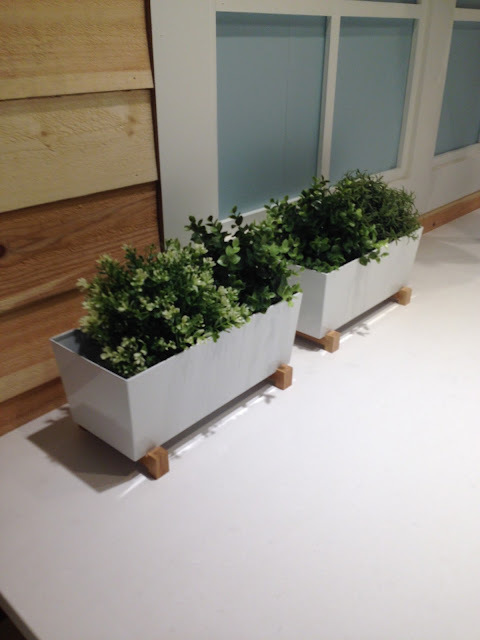 I've noticed the plain wooden bases on planters are really trending. Another industrial pendant light I liked. 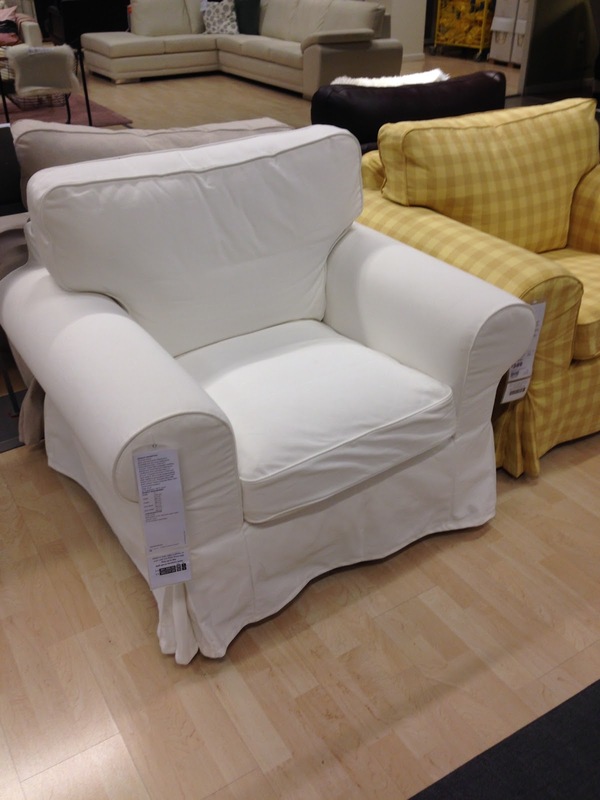 Here is the slip covered chair that goes with the slip covered couch. Again, just not comfy and pretty pricey to me. 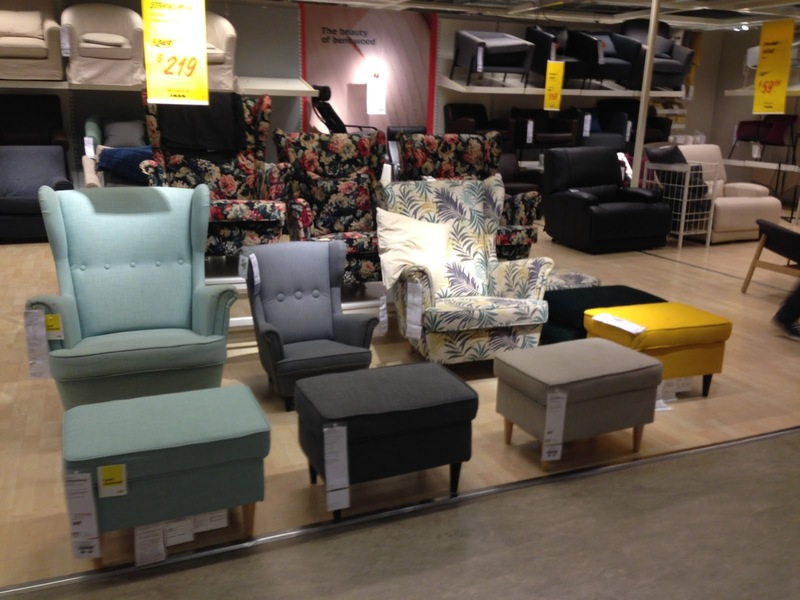 The chair is $349 alone plus another $169 for the ottoman. One thing I noticed while shopping for new furniture for my home was how expensive ottomans are. They are almost as expensive as the chair! I wonder why. It's almost as if they do that on purpose, because they know you NEED the ottoman to go with the chair, so they overcharge you. I really liked this pendant lighting. 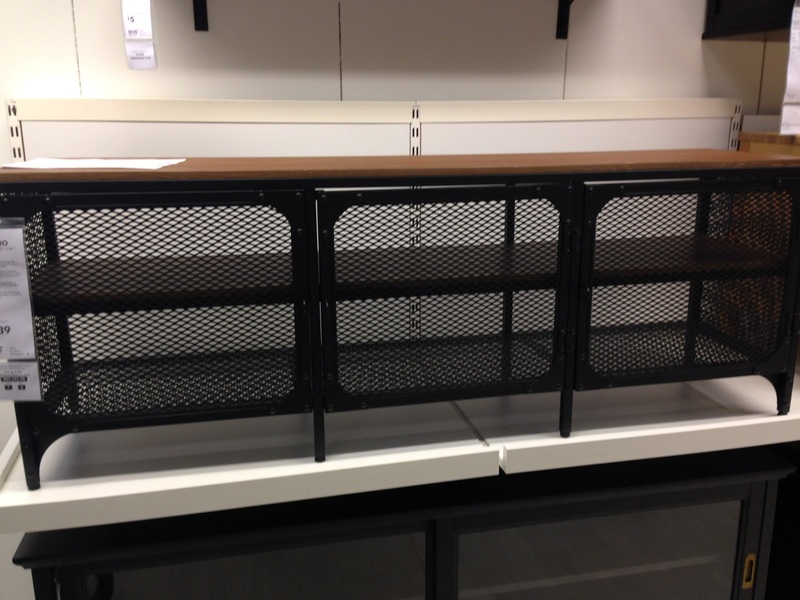 This 'basket' cover is actually sold separately. I think out of all the lighting I saw, this one might work best in my home. 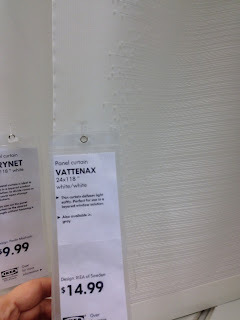 I love the texture it will bring to a room. Alethea had so much fun in the kid's area of IKEA. 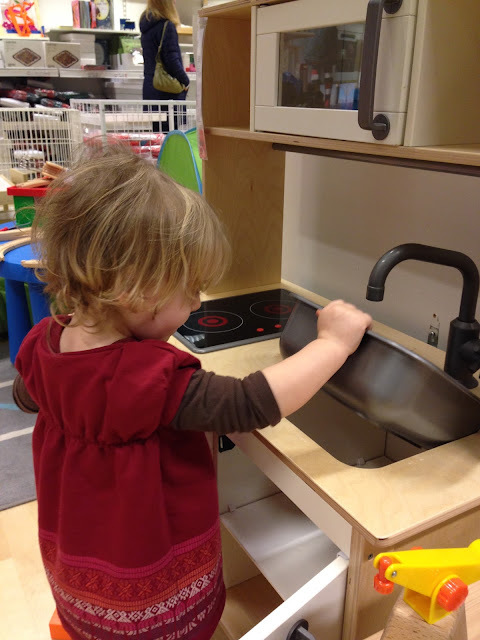 She loved playing with this play kitchen. It blew me away with how she knew how to turn on the water faucet, fill dishes with water, and cook something in the microwave. I could tell she must watch mom and dad cook in the kitchen a lot. 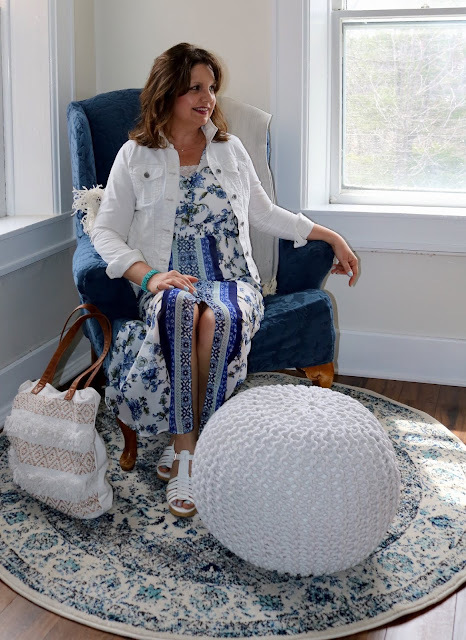 I did like these updated retro versions of wing chairs and found them the affordable at only $279 (current on line price) and the ottoman is only $69. I'm keeping an eye out for a new entertainment center for our next room remodel. I liked the industrial look of this one, plus the metal will help keep the grandkids from pushing the buttons on the tv components! I've been trying to figure out what to do with the windows in our living room. We really don't need curtains in that room, as there are no privacy issues. 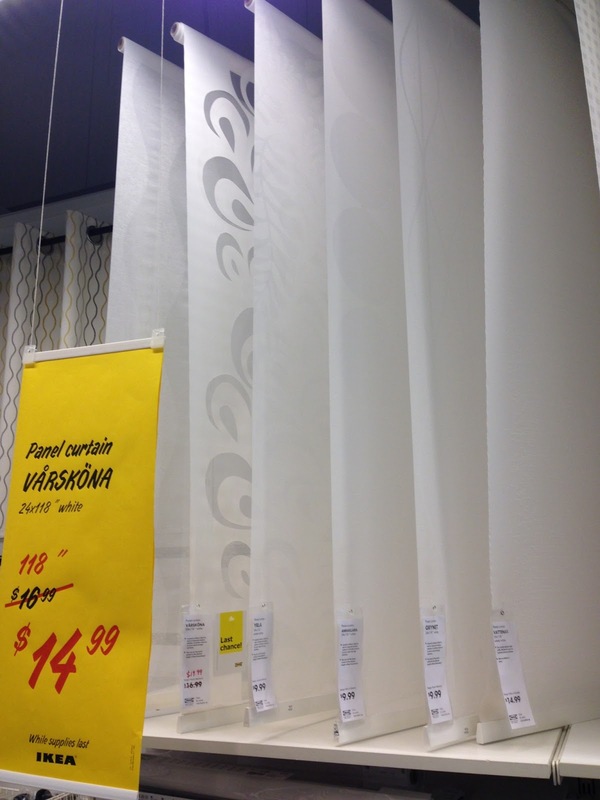 I thought of having no window treatments at all, but it just seems kinda sterile to me. So then I considered these: they're not shades, because they don't roll up. 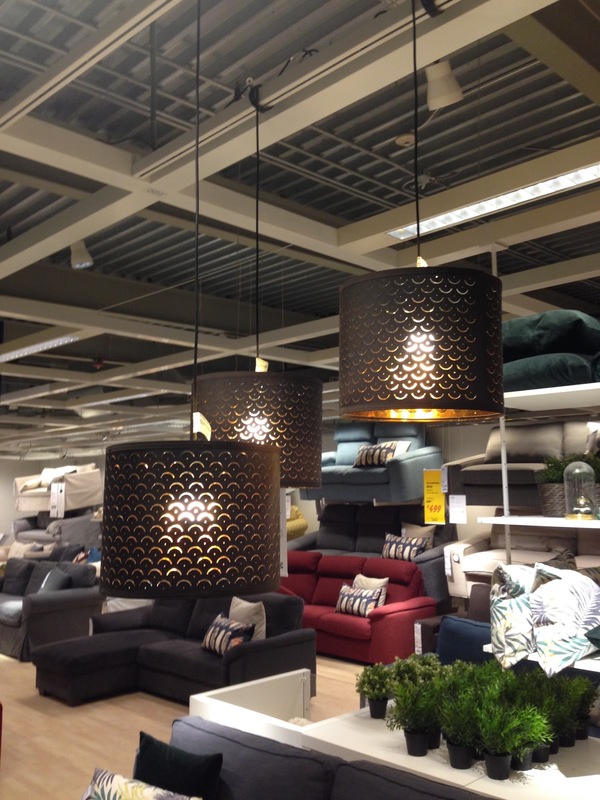 They are just stiff fabric that could actually serve as a room divider too. They come in a variety of patterns. I thought they were pretty cool, but hubby dismissed them because they would block his view. 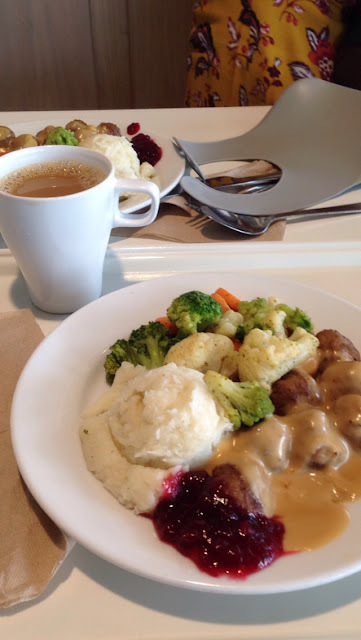 I always look forward to shopping at IKEA not just for inspiration for my own home, but also so I could eat in their cafeteria. I love their Swedish Meatballs! I tried their salmon dish once, but when a friend suggested I try their Swedish Meatballs, I've ordered that ever visit since. They also sell their meatballs in their frozen food section, but because I was traveling I couldn't buy any to take home. Alethea went crazy for them! She loved them so much! Finally, here are some other pictures I took while shopping with Alethea at other spots in Illinois. The weather was really bad the week I was there, so other than the zoo and the children's museum, shopping and a movie/restaurant with my son was all I did. That's O.K., as I love to shop when I'm in Illinois because they have so many more stores than we do in my small town. 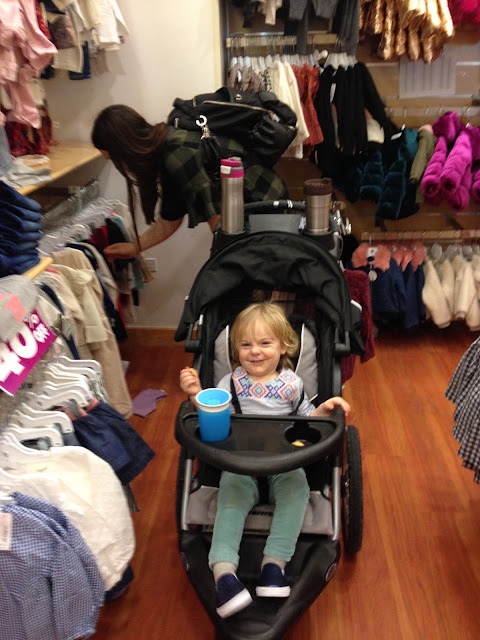 Here Alethea and I played together at a play area in a mall while mom shopped in a nearby store. 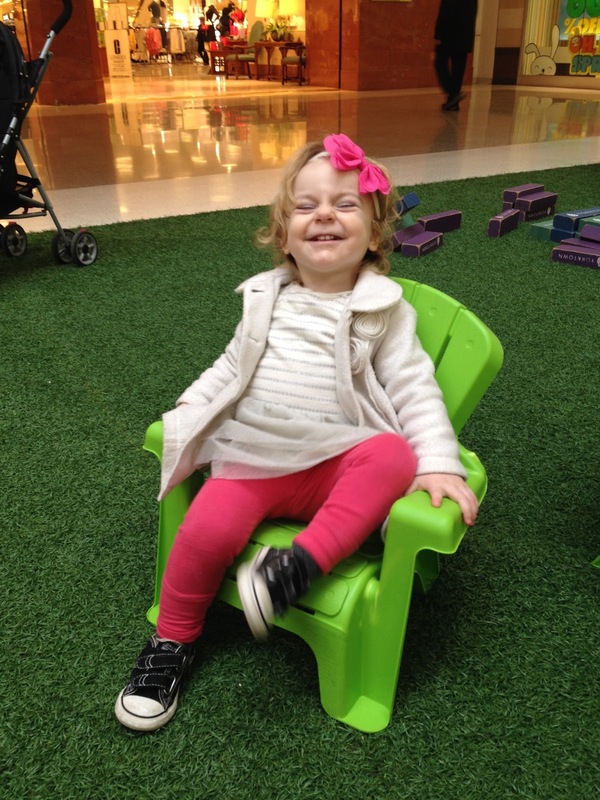 Alethea loved these little chairs and I thought the colors of the chairs went so well with her outfit. She is such a cutie pie. Her mom texted me yesterday that Alethea got her very first "boo boo" when she fell down while playing outside. I sent Alethea a text with kisses and lipstick emojis for her boos boos and Ashley said that she is "enjoying all the sympathy she is getting over her boo boos." Well unfortunately this will be a temporary end to my travel posts (I will pop in on Wednesday with a few 'Staycation" posts). My husband and I decided not to take a spring vacation this year so we could complete some much needed house projects instead. I must admit, it was very hard on me not to take a spring vacation. I always look so forward to getting away somewhere warm after a long, hard winter. But we are taking a vacation in the fall, we are going back to UTAH! I fell in love with the state of Utah when we drove to Las Vegas a few years ago. Unfortunately, we had a car issue and we never got to Zion National Park, so we always planned on going back. This time we won't be going alone, we will be taking our son with us. He's never seen landscape like Utah before, so I'm sure he'll be blown away. Tuesdays are the days I posts my crafty endeavors. If I don't have a craft or a handmade card to share, I show my Bible Journaling Pages. If your new to Bible Journaling and want to learn more about it, see this post HERE! 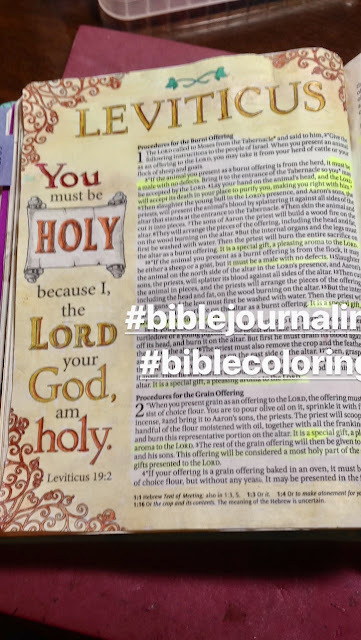 I use the Inspire Bible which has some pre-printed pages, that I can just color in, but I also venture off and get creative sometimes and create my own pages. Here are some of my Bible Journaling pages as I continue to trek through the Old Testament. “You are the light of the world. A town built on a hill cannot be hidden. 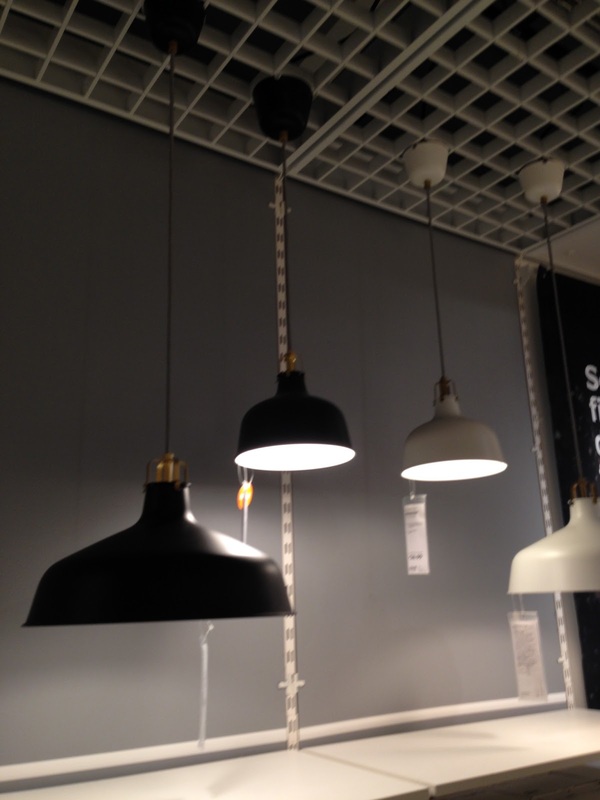 15 Neither do people light a lamp and put it under a bowl. Instead they put it on its stand, and it gives light to everyone in the house. 16 In the same way, let your light shine before others, that they may see your good deeds and glorify your Father in heaven." 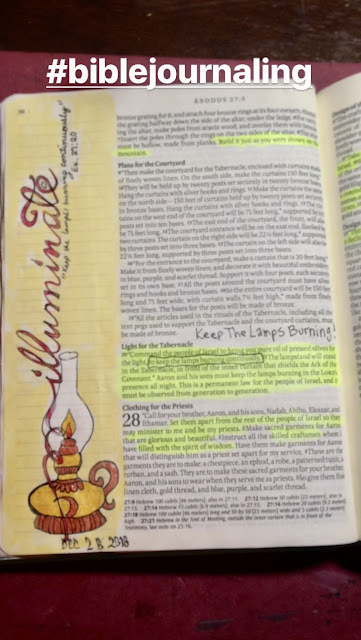 I created my page by tracing the words "illuminate" and the lamp from my "Complete Guide To Bible Journaling" book. I colored the background yellow water colors. I then hand wrote the scripture reference under the "Illuminate" word and I also circled in the scripture itself. 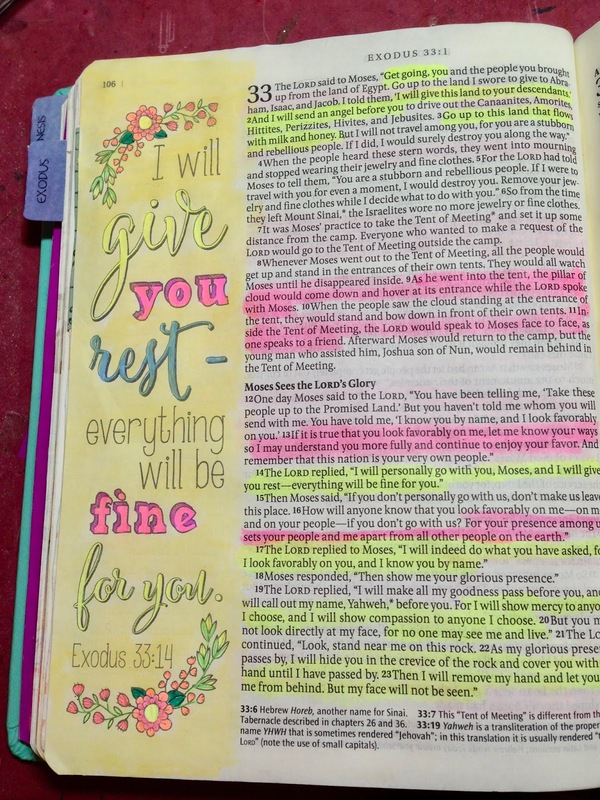 The lamp and "Illuminate" word were colored with gel pens. 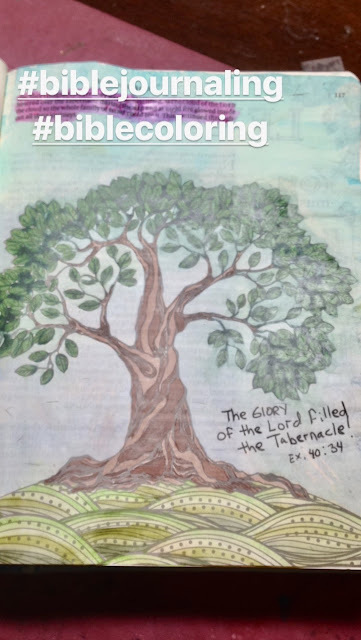 When I was reading through all of God's instructions to the Israelites on how to build the tabernacle, I was so pleased to see how many times God praised crafters, people who could sew, embroider, weld, engrave, carve, etc. If you can craft, you have a gift from God! So to celebrate my crafting gift from God, I created this fun page. I used a couple of old stamp sets for some of the words and images. The ruler is washi tape. The background was colored with gelatos. 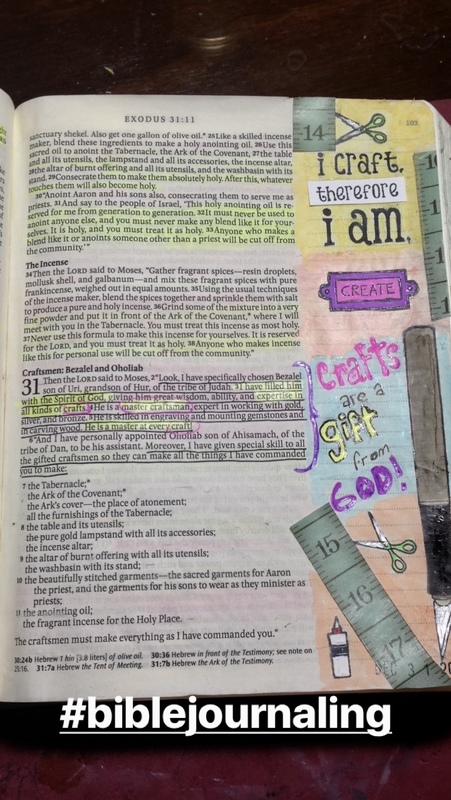 I hand wrote the sentence "Crafts Are A Gift From God!" This is a pre-printed page that I simply colored in using gelatos and gel pens. Here is another page I created myself. 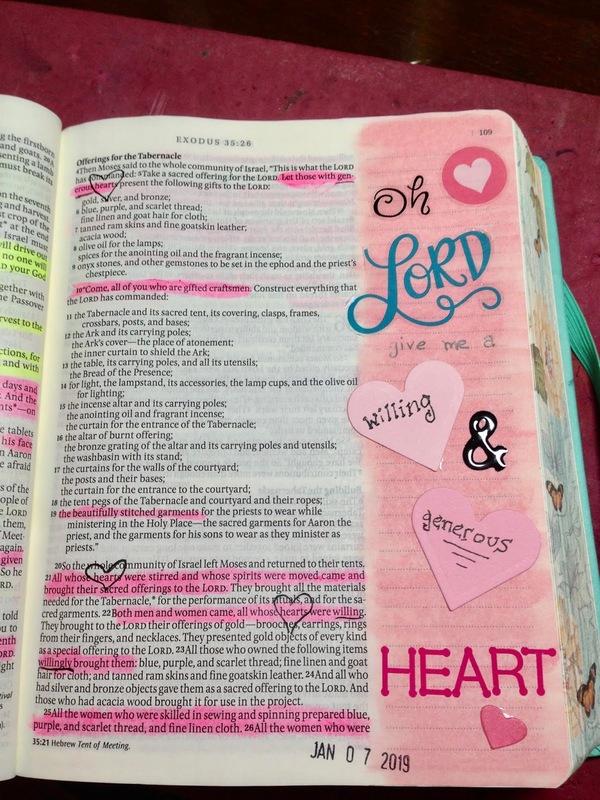 As I read this chapter, I noticed how important it was to God to have "Willing and Generous Heart". He wants us to give with the right attitude! I think I always tend to give out of obedience and often times resentment. I give, but I don't want to, there are a lot of other things I would rather do with that money....like buy a new car, go on a vacation, or simply put it in the bank. But regardless of my feelings, I still give because God tells us to. But, oh, how I wish I could give with the right heart: a willing and generous one! To create my page I colored the background with pink gelatos. I highlighted verses in the scripture with a pink highlighter and drew a heart around every word "heart". Many of the words on my page are stickers, but I also hand wrote a few too. The two large hearts were cut using a Cuttlebug, one of the little hearts was created with a heart punch. This is just a pre-printed page that I colored in using Stampin' Up! Markers. The beginning of a new book in the "Inspire Bible" always has a fancy pre-printed page. I colored the background with yellow water color first, then I did all the letters and fancy scrolls with gel pens. My last page was also a pre-printed page that I colored in with gel pens. I hope you've enjoyed looking at my Bible Journaling pages and that I am inspiring to dig deeper into God's word in whatever way works best for you. 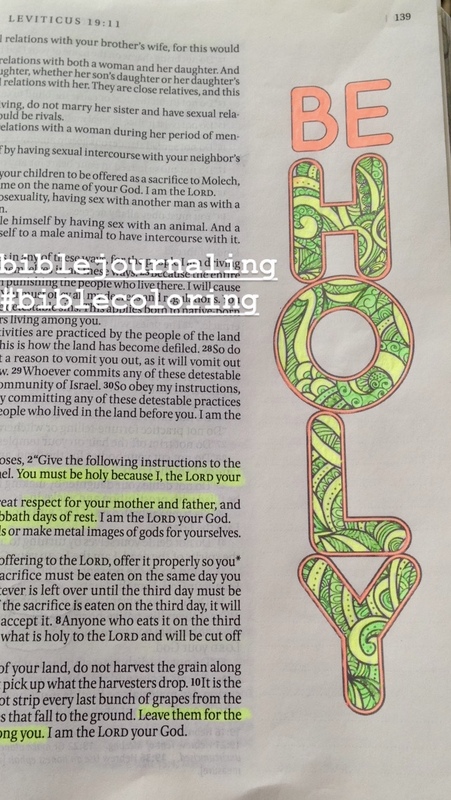 Bible Journaling really has deepened my hunger for delving deeper into the Bible. Happy Belated Easter! I hope everyone had a wonderful day. Ours was very uneventful. We just went to church and then came home. I made an Easter ham for my husband and I. We were blessed with beautiful weather this year, which is rare in Wisconsin to have beautiful weather on Easter Sunday. I didn't get to enjoy it much, as I was cooking all day, but I did sit on our porch briefly, and it was a joy to have the windows open and feel the warm breeze and hear the birds singing. Because we had such nice weather, I was actually for the first time in many years able to wear a Easter dress to church. 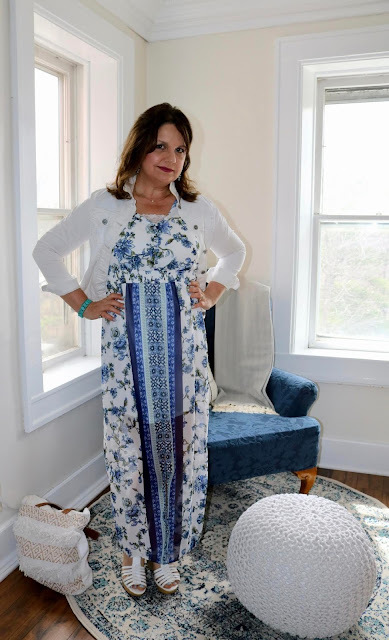 I chose an old maxi dress that I previously showed you in a "Grandma & Me" post HERE. 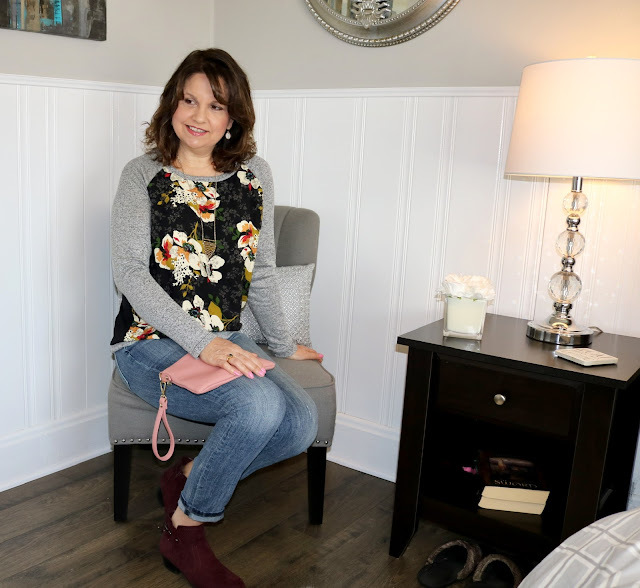 You are also getting a sneak peek at my new living room in this post. I am so sorry I haven't done a big reveal post yet, but would you believe this room is still not done? This room has been such a disaster remodel, I don't want to say too much yet, as I will wait for the big reveal post, but let's just say NOTHING has gone as planned. It is almost complete, I have a few more finishing touches, and I should be able to show you the room and explain everything that happened soon. 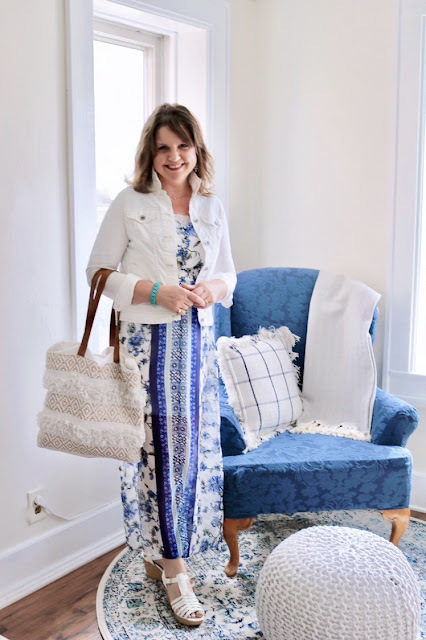 In my "Grandma & Me" post I styled this maxi dress alone, with different jewelry and shoes. 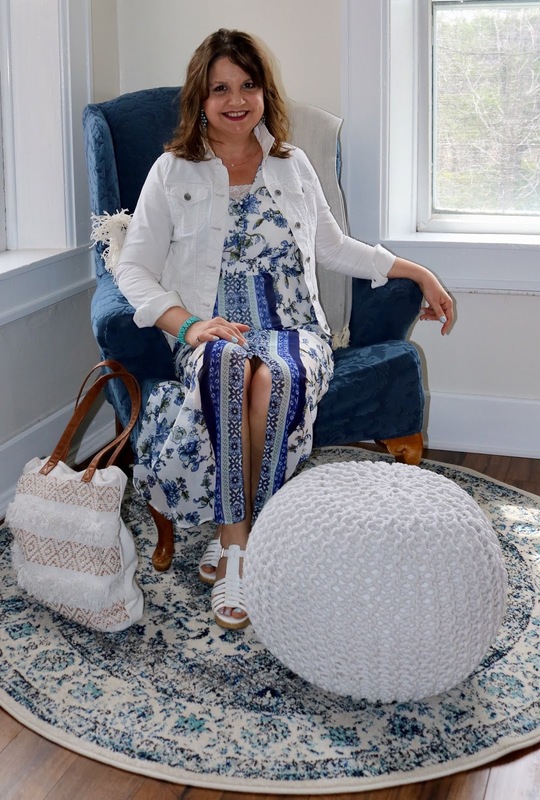 This time I styled it with a denim jacket, a pair of white wedges, and teal jewelry. The maxi has a short white slip underneath. The floral printed portion is sheer and there is a slit in front. It's a unique feature in a maxi dress that I like, because my legs are covered, yet you can still see them. Shoes are from JCPenney (old). The teal jewelry is all from my stash (unknown and old), and the ring is vintage. Denim Jacket - Kohl's (old). My 27th box from Stitch Fix was a pretty good one. I really liked everything, but I only LOVED a couple of things. I almost kept the entire box, so I was completely surprised and perplexed about my Instagram Poll, because those gals didn't seem to be thrilled with anything in my box. I still loved what I loved, no matter what the pollsters thought, so I kept those items, but everything else I decided to send back since I wasn't 100% sure about them anyway. So, now I will first share with you the last item in my 27th box, and then you will find out what items I kept along with the results of my Instagram Poll. 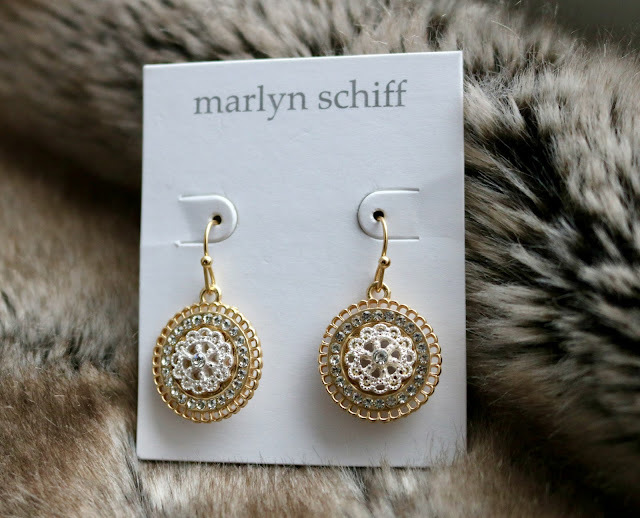 Marilyn Schiff "Delilah Round Crystal Earrings"
I thought these earrings were so pretty! I loved that they are round drop earrings. I don't think I own any round earrings. They also have a pretty sparkle in real life. They are a good size too. Below I left my thumb in the picture so you could see the scale. They are large enough to actually notice with my long hair, but not too large that I feel uncomfortable wearing them. For whatever reason, they only received a 50/50 vote on Instagram; although they were the 2nd most popular item in my Fix. 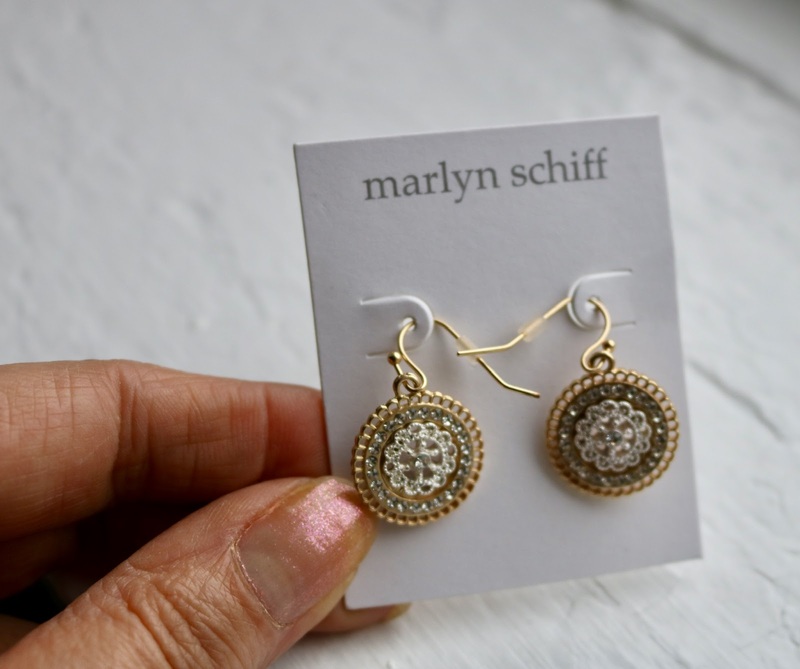 I have no idea why anyone would not like these earrings, because I thought they were beautiful. Collective Concepts "Rebell Maxi Dress"
This dress was my most favorite item in the box. 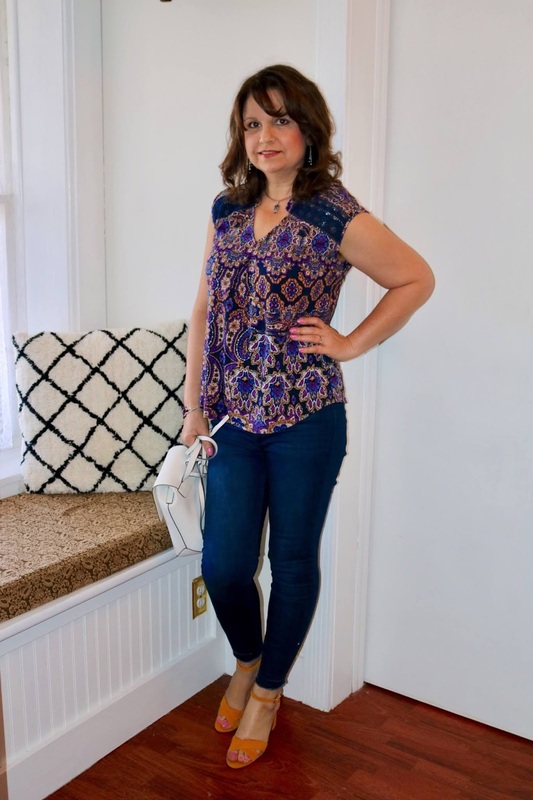 I loved the color and the style, and as one reader noticed, I felt confident and beautiful wearing it. It was definitely a keeper for me! It was the most popular item on my Instagram Poll coming in at 58% Keep and 42% Return, but I thought those "Keep" Numbers were still pretty low for such a gorgeous dress. Again, I have no idea what my readers didn't like about this dress, unless they don't like maxi's in general or the color. Green florals are so in this season! If you can only buy one new item this summer, buy a green floral dress! Kut From The Kloth "Benter Mixed Material Top"
Ugh! I really liked this top. I still wonder if I made a mistake returning it. It was so comfy and I liked the print. I think my mind is just looking forward to the spring/summer months, and I really didn't want to add any new long sleeve top in my closet right now. My Instagram Pollsters didn't like it all. Only 17% said to Keep it, and 83% said to Return it. Again, I have no idea why, cause I think it's pretty cute! Sweet Grey "Rojallio Bell Sleeve Knit Top"
This was another cute top that was hard for me to return. I liked the mustard color and the small white floral, but I didn't like how I could see the white inside of the bell sleeve. I wish the bell portion of the sleeve was lined. I also felt that I am getting too many bell sleeve tops in my closet. I already kept THIS ONE from an earlier box of Stitch Fix that has the exact same cut, but a different pattern. Also, for the same reason I returned the Mixed Material Top above, my mind is focused on more summery tops, and I couldn't see wearing this often when the temperatures rise. My Instagram readers didn't care for this top at all, rating it 18% Keep and 82% Return. Daniel Rainn "Caleena Pleated Shoulder Crochet Detail Knit Top"
This last top I agonized over the most whether to keep it or not. 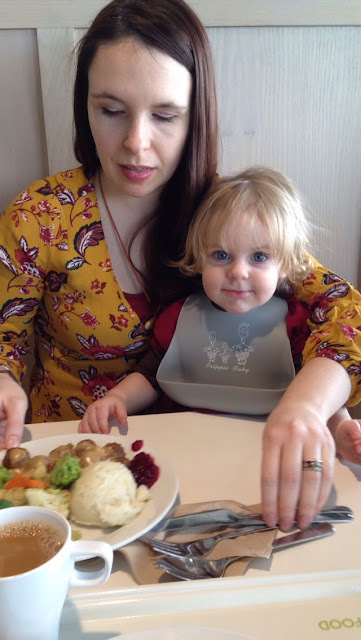 It was a good summer top, which I was looking for. It was a very soft knit, and super comfortable to wear. 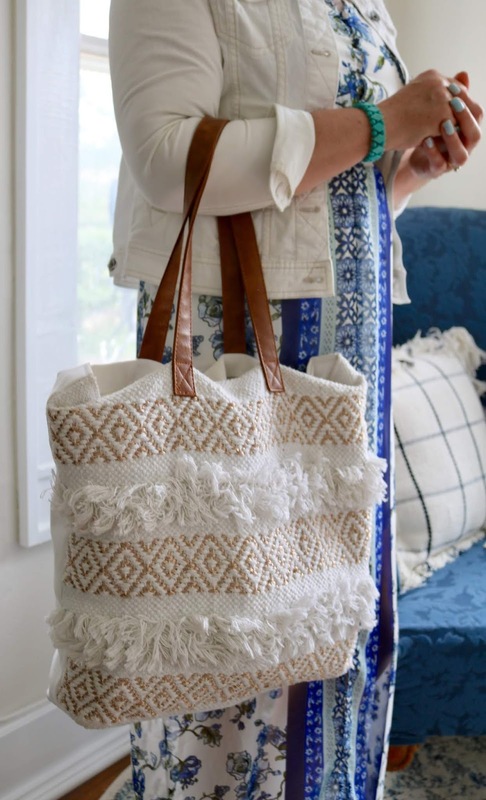 I really liked the flow of the fabric and the crochet detail. But in the end, I returned it because I couldn't get past the weird pattern and the patterns also didn't line up properly in the seam line. In addition, it wasn't the best sleeve style for my arms. The top did come in at Number 3 on my Instagram Poll with 42% Keep and 58% Return, but it was still kinda low. Those low poll numbers influenced me to return the top. I do listen to you gals if I'm on the fence about an item! I really value your opinion! In summary, I received three tops, one dress, and one pair of earrings in this Fix. I kept two items: the dress and the earrings. Overall, I really liked everything in this Fix, but I returned the tops because I'm moving on to warm weather clothes and I also had some structural issues with a couple of the tops. 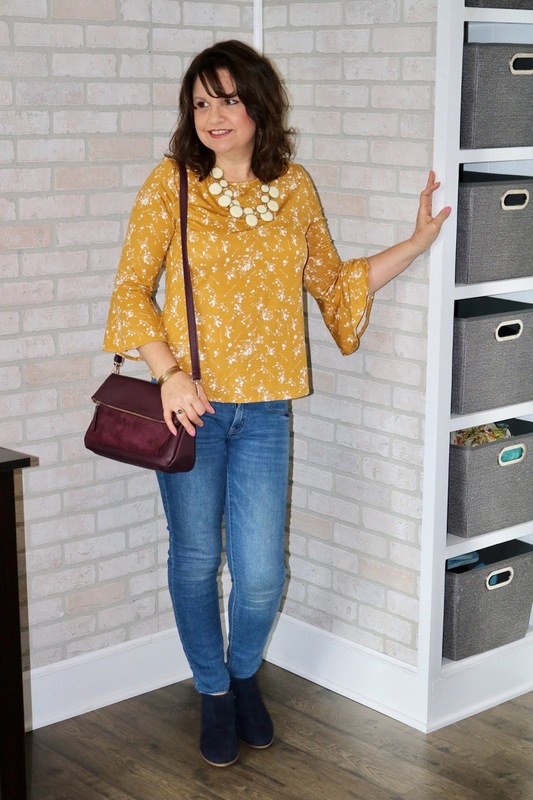 If you've never tried Stitch Fix before, use my REFERRAL CODE to receive $25.00 off your first box!